The Rottweiler may seem aloof, but he is a brave and intelligent worker. 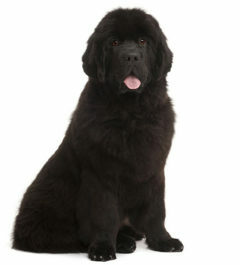 He performs well in outdoor sports and is a faithful companion and guardian. The exact ancestry of the Rottweiler is not well known. Most historians believe that this breed descends from drover dogs used by the Romans to move livestock many centuries ago. How the Rottie transitioned from a herding dog to the animal so well-known today is probably attributable to the Roman’s desire to conquer all of Europe. Vast armies were needed for this effort, and they had to bring their food sources on the hoof, as they were without the benefit of refrigeration. Herds and flocks required management by dogs of great strength and stamina that were also capable of guarding the soldiers and stock at night. The Roman drover dogs were perfectly suited to these tasks. Sometime around 700 A.D., a local ruler ordered that a Christian church be built on the site of ancient Roman baths in southwestern Germany. During the excavation, red tiles from Roman villas were discovered, and the site was named “das Rote Wil,” meaning “the red tile”. This site is now called “Rottweil.” It developed into a cultural trade center and hub, and was extensively fortified in the 12th century, which attracted even more commerce. Many cattlemen and butchers settled there, and they needed dogs to help them in their trades. These Roman drover dogs and their descendants worked cattle and drove them to market until well into the 19th century and became known as the Rottweiler Metzgerhund, or the Butcher’s Dog. With the onset of the industrial revolution in the mid-1800s, cattle-driving by drover dogs became replaced by the railroad, causing a drastic decline in the need for and numbers of the Rottweiler. Not much was written about the breed until 1901, when a combined Rottweiler and Leonberger club was formed. The club created a written standard for the Rottie, addressing both physical type and temperament. During the first part of the 20th century, Rottweilers gained popularity as police dogs. 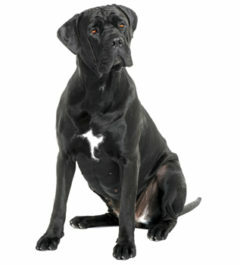 The breed also was used by the German army during the first World War. A number of different breed clubs were founded in Germany after the war, with duplication, dissention and confusion. Eventually, in 1921, the Allgemeiner Deutscher Rottweiler Klub (ADRK) was formed. It published its first studbook in 1924 and remains active to this date. The American Kennel Club admitted the Rottweiler into its Stud Book in 1931. The official standard for the breed was approved in 1935, and the first Rottweiler earned an AKC conformation championship title in 1948. The American Rottweiler Club was formed in 1971 and is the parent club of the breed in the United States. 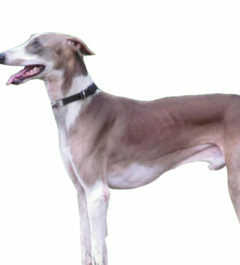 The Kennel Club (England) recognized the breed in 1966. Rottweilers are very brave, loyal, and obedient. Their protective and watchful nature makes them great watch dogs. They will literally risk their own lives for their family. This breed can make good playmates for children as long as proper socialization occurs at an early age. They can also get along well with cats and other household animals, if trained early. Outer coat is straight, coarse, dense, of medium length and lying flat. Undercoat should be present on neck and thighs. The Rottweiler should have a rubber glove used to remove dead hairs during times of shedding. The ears should be cleaned often and the claws kept short. Rottweilers are actually a relatively healthy breed and don’t have many hereditary diseases. 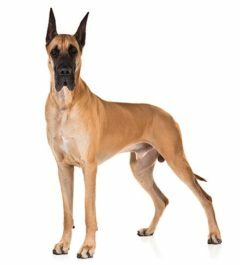 As with many large breeds of dog, joint problems and hip dysplasia can be a frequent theme, especially in the dog’s later years. It can also become obese if overfed or under-exercised. Rottweilers can be highly responsive to training that takes advantage of its general fearlessness. It’s assumed that this breed is naturally aggressive but you can find them to be peaceful in its down-time. Because it is so responsive to training, however, Rottweilers are often used as police and guard dogs and will fully embrace these roles. Rottweilers, however, have also been used as messenger dogs and have even helped medical teams in the past. Rottweilers are more versatile than many people give them credit for – this is, again, thanks to their general obedience and responsiveness to working with humans. 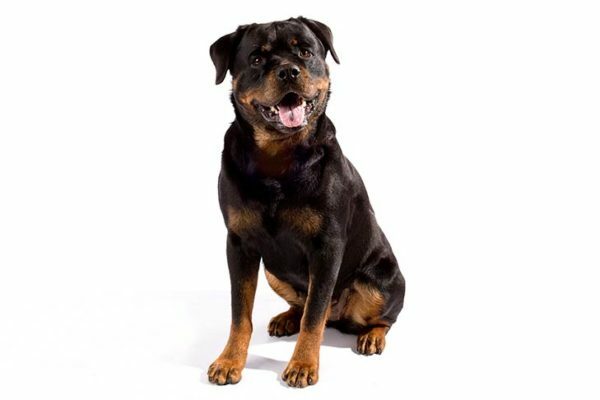 Quality training is important in Rottweilers and if you haven’t worked with dogs before, a Rottweiler is not always a good breed to start developing your skills with. Friendlier dogs like Labrador Retrievers are better large breeds for people without a lot of dog experience. The Rottweiler needs a lot of exercise, including running in open country and playing catch, when possible. The Rottweiler has a fairly typical diet compared to many dogs its size – in males, adult Rottweilers can be over 100 pounds in weight. This corresponds with a fairly aggressive appetite. Rottweilers, like many dogs, often prefer meat as a treat but can find nutritional value in other dog foods as well as vegetables. The Rottweiler might have a reputation as a biter, so it’s generally a good idea to keep your dog properly exercised and fed. No one likes a grumpy Rottweiler.